Galvanized core wire mesh is coated with a thick layer of black PVC, tightly bonded to the wire. The entire hardware cloth mesh is thoroughly sealed and protected against rust and corrosion. This material will last! The 1/2" mesh, sometimes called 2 mesh, is lighter in weight and strength than the 16 gauge 1/2"x1/2" mesh and therefore costs less. Particularly useful for animal enclosures and exclusion barriers - applications where a light mesh, rust prevention and long life are desired. It can be used as low cost flooring for chukar pens, though we recommend the heavier 16 gauge material. 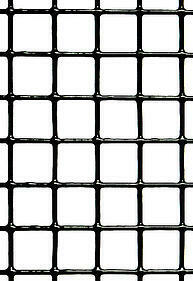 1/4" mesh is ideal for problem wildlife exclusion. The black color is virtually invisible when installed. And the mesh will last for years. Vinyl Coated - 19 gauge, 1/2"x1/2" mesh, 24"x100' - 48 lbs. Vinyl Coated - 19 gauge, 1/2"x1/2" mesh, 36"x100' - 72 lbs. Vinyl Coated - 19 gauge, 1/2"x1/2" mesh, 48"x100' - 96 lbs. Vinyl Coated - 19 gauge, 1/2"x1/2" mesh, 60"x100' - 120 lbs. Vinyl Coated - 19 gauge, 1/2"x1/2" mesh, 72"x100' - 144 lbs.